About noon on the 8th of March, one of our quartermasters pointed out a dark looking object with Very large smokestack coming out from Norfolk and steaming down toward Sewells Point in company with two smaller steamers. From the description we received from time to time, of the Merrimac, we quickly came to the conclusion that it was this formidable and long expected rebel Iron Steamer. Every one hurried to the deck to get a sight of her. She had by this time nearly reached Sewell’s Point, and her outlines were quite apparent. Her covering was shaped like the roof of an old fashioned house, the eaves of which projected over its sides. Our crew was beat to quarters, and awaited her approach in silence. 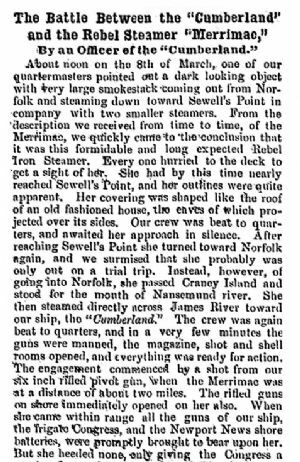 After reaching Sewell’s Point she turned toward Norfolk again, and we surmised that she probably was only out on a trial trip. Instead, however, of going into Norfolk, she passed Craney Island and stood for the mouth of Nansemund river, she then steamed directly across James River toward our ship, the “Cumberland.” The crew was again beat to quarters, and in a very few minutes the guns were manned, the magazine, shot and shell rooms opened, and everything was ready for action. The engagement commenced by a shot from our six inch rifled pivot gun, when the Merrimac was a distance of about two miles. The rifled guns on shore immediately opened on her also. When she came within range all the guns of our ship, the frigate Congress, and the Newport News shore batteries were promptly brought to bear upon her. Our good old ship commenced to sink immediately after the collision, and it was soon told through the ship that we were rapidly going down, but each man was busy at his work, and no one appeared to care much where we went, only that we did not go to Richmond. After running into us she drew off and asked commander Morris to surrender. “I will never surrender,” replied Lieut. Morris. “Then I will sink you." “Sink away, replied Morris. A cheer went throughout the ship from stem to stern, and from the upper deck to the cockpit, at the brave reply, the echo of which was drowned by a sound move terrible, the sound of the Merrimac’s broadside, which cut our brave men down by the dozen, and the wounded in large numbers were brought into the sick bay, with broken bones and lacerated and splintered flesh, groaning and shrieking with pain. We did what we could for the poor fellows, immediately making them as comfortable as possible until we had time to give them better treatment. An exploding shell knocked the ventilator down on the heads of Surgeon Martin, his Assistant, and Steward, at the same time nearly deafening all in the bay. In a few minutes another exploded in the sick bay, instantly killing five of the wounded sufferers, and to add to the horrors of the scene the water now came rushing in on all sides, admonishing us to find a higher latitude. The wounded were quickly removed to the cockpit and steerage, which was already half filled with them. After firing into us she again withdrew a short distance and ran her prow into the ship sides the second time. Capt. Buchanan now came to a part of his ship and again asked Lieut. Morris to surrender. His reply was "no, we will die first." At the same time a well-aimed shot by a marine named Gates brought down the traitor Captain. Lieut. Morris now ordered the red flag to be raised to the fore mast-head, which, the rebels seeing imperfectly through the smoke, mistook for a white flag, and shouted over what they supposed to be a victory, but the shout was re-echoed from the “Cumberland," when it was seen to be the red flag of victory or death. The officer on the Cumberland in question was Dr. E. A. Kershner of Clear Spring. The Merrimac is more correctly known, at the time of this battle, as the C.S.S. Virginia. The U. S.S. Merrimack had been captured and rebuilt by the Confederates as an ironclad and renamed the Virginia. The fact that the battle at Hampton Roads is often called the battle of "the Merrimack and the Monitor" rather than "the Virginia and the Monitor" may be because much of the press coverage was by Union newspapers and magazines who, along with the Union military, may have knowingly continued to use the prior name of the ship rather than her proper name. See Virginia, Merrimack, or Merrimac?